Please find the links below for the Easter holiday workshop details! We also welcome our new venue BALMORAL along with The Flash Bang Science club holiday workshops. Our apologies for late release as I am sure you can imagine we have all been very busy with last Saturday’s Franklin Children’s Art Festival organisation. The event was a great success and we hope those who came along enjoyed it as much as we did. This entry was posted in Holiday Workshops, Newsletters on 09/03/2015 by Phil. We have on 23 & 30 August a Special Saturday clay workshop over two weekends from 10am til 12 Noon at our home studio. No experience is necessary and all materials are supplied. $70 for both Saturday classes. Click here for further details. This entry was posted in Holiday Workshops, Newsletters on 17/08/2014 by Phil. We now have our Spring Holiday workshops available – please click the relevant location for further details. This entry was posted in Holiday Workshops on 17/08/2014 by Phil. Create an imaginary, colourful and quirky creature from the deep blue sea. Your very own species, never seen before by man. You will get to play with funky fabric, ribbon, lace, wool, tassels, buttons, beads, pins and more! Just come along and we’ll go and explore. Recycle old bottles into a flower vase and create your very own unique work of art. Design your personal creation using brightly coloured acrylic paints. Spectacular presents! Create your very own pen or art supply holder using boxes, tubes and other exciting shapes. Decorate them with exciting materials to match your bedroom or art room. Practically perfect! Create an awesome giant Easter egg with papier mache, design your individual eggs with painted scenes, decorate with fun materials and create 3d characters to go inside. Absolutely funtastic! Learn portrait drawing skills and a variety of mixed media techniques to create your personalised portrait. Perfect wall art! Ph. 09 238 1939 / Mob: 0297 712 923. This entry was posted in Holiday Workshops on 25/03/2014 by Phil. Christmas 2013 Additional Holiday Workshops! Creative craftiness all around with this hands on workshop. Learn to make your own beautifully colourful papers for your individual angels or Christmas trees. Add the finishing touches giving you a decoration for years to come. Learn a variety of mixed media techniques in this magical painting workshop. Create a perfect piece of wall art for your bedroom or a Christmas gift for someone special. This entry was posted in Holiday Workshops on 09/12/2013 by Phil. 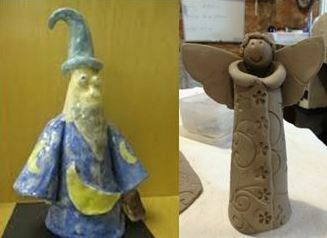 Special Christmas Clay Weekend Workshop!! A special Christmas Saturday morning workshop spread across two weeks in December. Creative Christmas clay decorations and plaques. Learn many different ways to experience the medium of clay, then under-glaze your work with beautiful colours. Final pieces will then be placed in the kiln to ensure fantastic and long lasting end results! No experience necessary. All materials supplied. This entry was posted in Holiday Workshops on 20/11/2013 by Phil. Download PDF version of holiday programme here. In this fantastic workshop you will need lots of creative energy. We’ll show you the secret of making a gorgeous Gingerbread House using simple things like a shoe box, cotton wool, fabric, lace, buttons, straws and lots more exciting items from inside our workshop. Kids don’t forget to ask to help Mum to make some Gingerbread Biscuits to go inside! Create a variety of fabulous crafts in this festive action packed workshop including decorations, and card making. Oodles of creative of fun to get everyone in the Christmas spirit. For bookings or more information please contact Anna on: Ph. 09 238 1939 / Mob: 0297 712 923.